← Rivulet technique using watercolour…….and another hare! I wanted to have a play with the colours that kuretake have with their dual tip pens, they are water soluble and have a brush tip and a fine line end. I love the vibrant colours, and having only a few to plat with I wanted to experiment with the colours and how they blend. I used an old kitchen tile( anything shiny and flat will do) I then scribbled the pens and spritzed with water, I then picked up the colours in the usual way, the tile became my paint pallet! It just had to be another hare! 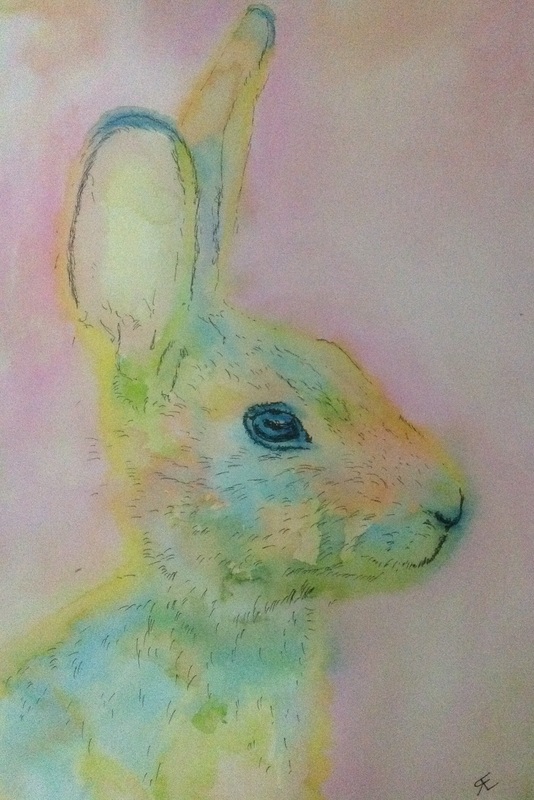 This entry was posted in art, dual tip, Hare, kuretake, rabbit, watercolour, zig and tagged art, dual tip, Hare, kuretake, painting, Painting, rabbit, watercolour, zig. Bookmark the permalink. The big word these days (heard it twice today) – Precious – and this is! Might layering solve the problem? I love the end result, btw. And good idea for your counter top palette. That could be a good plan, although I had so much pooling on this particular hare, so decided to stop,I might try with the next, and stretch this smoot card next time…… Or just staple it to a board?